We offer a vast range of Tin Cans for Candles that are available in square, round, rectangular shapes and different sizes. Our tin cans are printed with charming patterns, that enhance their look to a large extent. These cans are offered at cost effective prices and can also be customized in desired size and lengths as provided by the clients. Add more style to your fragrances Candle. We provide attractive round candle containers that are easy to carry and are offered with leak proof lids that fix tightly on the tin. 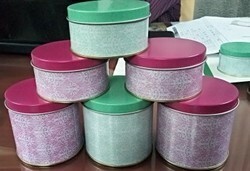 In order to keep pace with the never ending demands of customers, we are involved into offering wide range of Candle Tin.